Wisdom of Life. : She is a keen reader. One could be a work-alcoholic who is addicted to work but I did not know one could also be addicted to reading. Tesh is only fourteen who reads an average of two books a day. 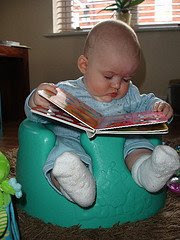 As a little baby, her caring mum read books to her. By the time she was three, she was reading all by herself. I believe she could have read thousand of books during these couple of years. Her mum found it too expensive to buy books for her. Instead she left her in most bookshops in town, when she could be left alone to read all by herself. She read all types of book, from novels to cartoons, either in English or Chinese. I had picked a few tips from her. Generally a good book should be read twice, in order to enjoy the contents. The first reading is fast and the second time is slow reading. Never judge a book by its cover or introduction because the real action is always at the centre column of a book. Whenever she reads, she could be like reading into another world of its kind. The book is a world by itself to her. The funny part of her is...though she reads to be knowledgeable but she is still too young to know how to apply what she had read. If she knows, I am sure she would be almost like a genius. I am not an addictive reader but I applied what I had read that matters most.